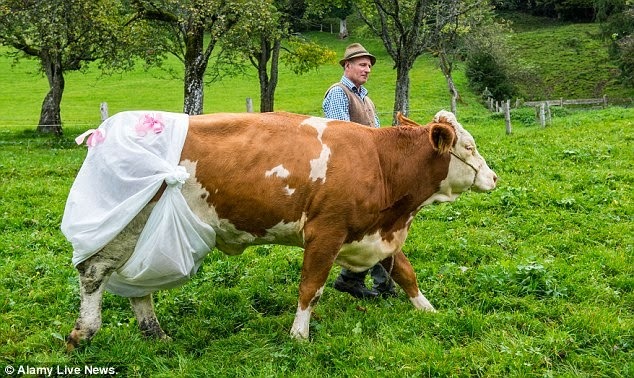 No, this is not a prank but Johann Huber, a cattle farmer in Bavaria, has started putting nappies on his cows to avoid falling, er, foul of an EU fertiliser law. The Bavarian dairy industry is convinced that there is no other way to comply with the latest environmental laws. New EU laws forbids ‘land application of fertilisers to steeply sloping ground to avoid leaching of nitrates and water pollution’. As the ban on ‘fertilisers’ also means cow poo aka cow-pats, the farmers have to find means to prevent the cows poo from coming into contact with the earth. 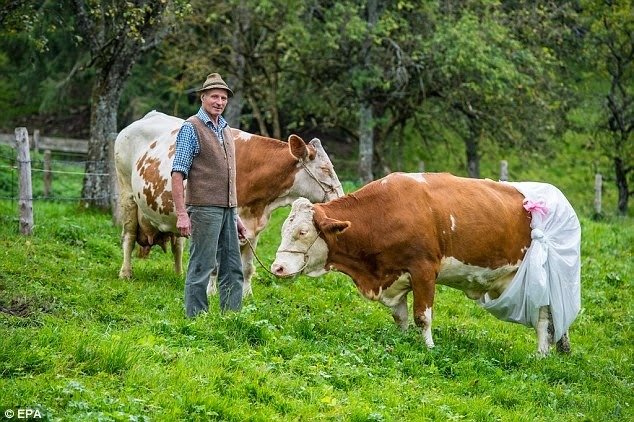 The cow in the picture is called Doris, the first of Herr Huber’s 18 animals who will be fitted with home-made nappies. ‘There are no commercially available nappies for cows yet,’ he explained. Unless this rule is overturned, there soon will be. And if this continues, do you not foresee the future problems? Will farmers have to install giant vats of sterilizing solution to soak the nappies? And mile-long washing lines to dry them naturally? Who is going to volunteer to change these dirty nappies? And how are farmers supposed to dispose of the cow poo aka cow pat, now that it’s considered a toxic hazard? This is, of course, the kind of complete madness we have come to expect when Euro bureaucracy meets eco-fanaticism. Sighh.....sometimes some people do not think , and it is worse when they are in the seat of authority and cause more problems for others.